The Middle Cedar Watershed spans 10 counties: Franklin, Hardin, Butler, Grundy, Marshall, Tama, Blackhawk, Buchanan, Benton, and Linn counties. It includes many small towns (e.g. Vinton, Traer, La Porte City, Jesup, Grundy Center, Ackley), several large metro areas (e.g. Cedar Rapids, Waterloo, and Cedar Falls), and 73% of the land is in agricultural production. 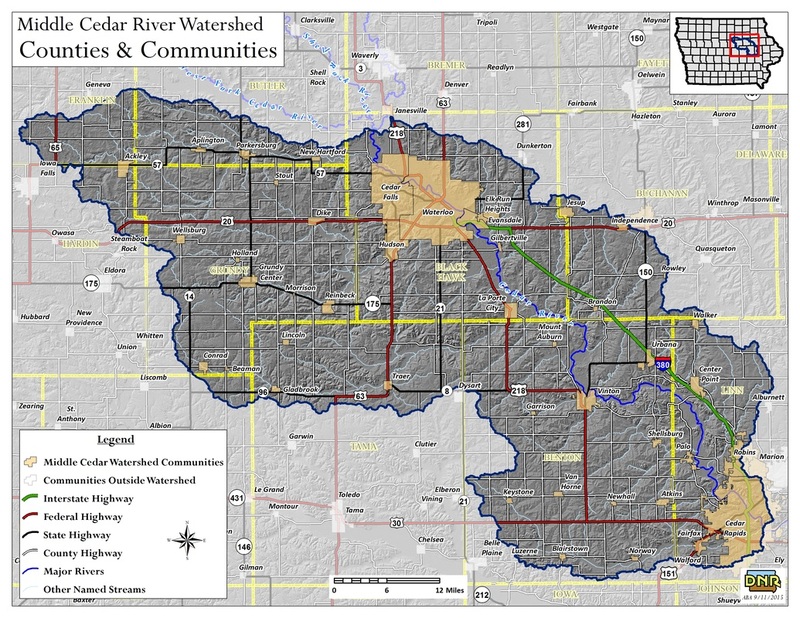 The Middle Cedar Watershed Management Authority was created to address water quality, water quantity, as well as other environmental issues that cross jurisdictional boundaries. Through the spring of 2019, a watershed plan is being developed to capture land-use data and public input to inform strategic priorities.